December at Sutter Creek Gallery: "Joyful Celebration"
For December, Sutter Creek Gallery is mounting a two-pronged membership show: “Joyful Celebration” will feature holiday and winter scenes as well as affordable art gifts under $50, with many well under that price. The holidays are not that far away. So instead of the usual sweater for Dad, or a blender for Mom, or box of candy for Aunt June, why not choose something unique at a reasonable price? Since this is a group show, items from all of the gallery members will be highlighted: Paintings large and small in acrylics, watercolors, pastels, encaustics and oils. Collages and mixed media pieces from teeny-tiny to sizable. 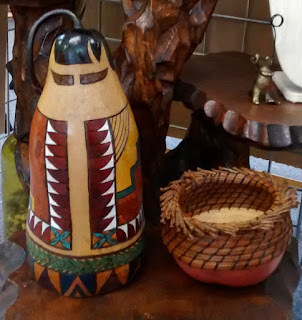 Photographs, fabric wall hangings, hand painted glassware, ceramics, gourds, sculptures, and so much more. Many of the artists offer prints and cards as well as small original artwork. Sutter Creek Gallery is the place to shop for the holidays and beyond. You are invited to the reception opening this show on Saturday, December 2, starting at 2 p.m. Come in and meet many of the artists who will be on hand at the cooperative located in the heart of Sutter Creek at 35 Main Street. The gallery is open daily (except Tuesday) from 10 a.m. to 5 p.m., our winter hours. Let’s face it: The holidays are coming way too soon. But since they are, Sutter Creek Gallery has lots of gift suggestions. "Joyful Celebration,”will feature affordable art gifts, some whimsical, some practical, and all of them unique. 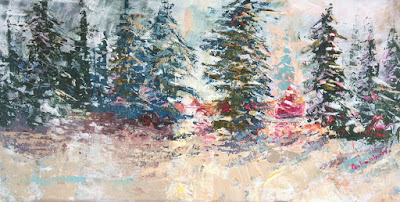 Of course, we will also be displaying a selection of new winter and holiday paintings to celebrate the season. We’ll be decorating a tree with ornaments for sale and providing refreshments for the show’s opening. Come join us for some holiday cheer and meet many of the artists who have contributed their talents to this member show. And bring your shopping list with you! 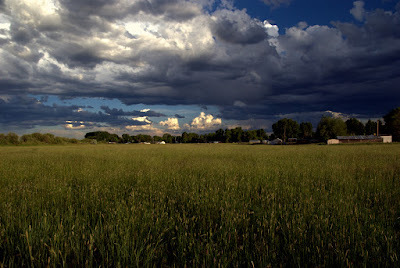 For additional information, call 209-267-0228, email suttercreekgallery@gmail.com or visit www.suttercreekgallery.com. These paintings will be 12x16 inches are smaller, perfect for a holiday gift or a special corner in your home. These pieces are offered as a way for customers and friends to collect fine art affordably and to share their love of art with others at the holidays. 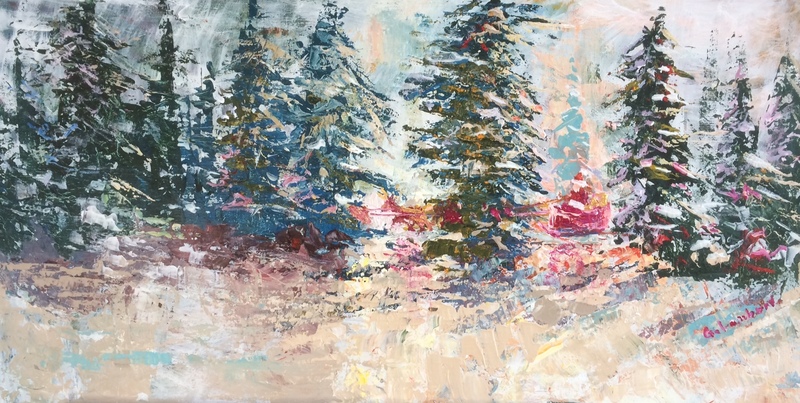 Paintings by Barbara Hoffman, Susan Hayne, Steve Holler, Lynn Slade, Stella Stevens, Sue Smith, Catherine Woodruff, Joanne Dedge, Ted Smith and Julie Trail will be available during this December show. A reception will be held on Saturday, December 2, 2-5 P.M., as part of the monthly Amador Art Trek and the Holiday Open House in Sutter Creek. 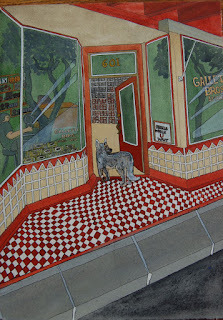 Gallery 10 is located at 15 Eureka Street, Sutter Creek. During these holiday weeks we will be open every day except Tuesday, 11-5. All are welcome at the reception. The show will hang all of December. 229 New York Ranch Road. Instead of an artist demonstrating at the Artists Association meeting on November 8, Tri- County Wildlife will bring several owls and a hawk to be sketched and photographed. 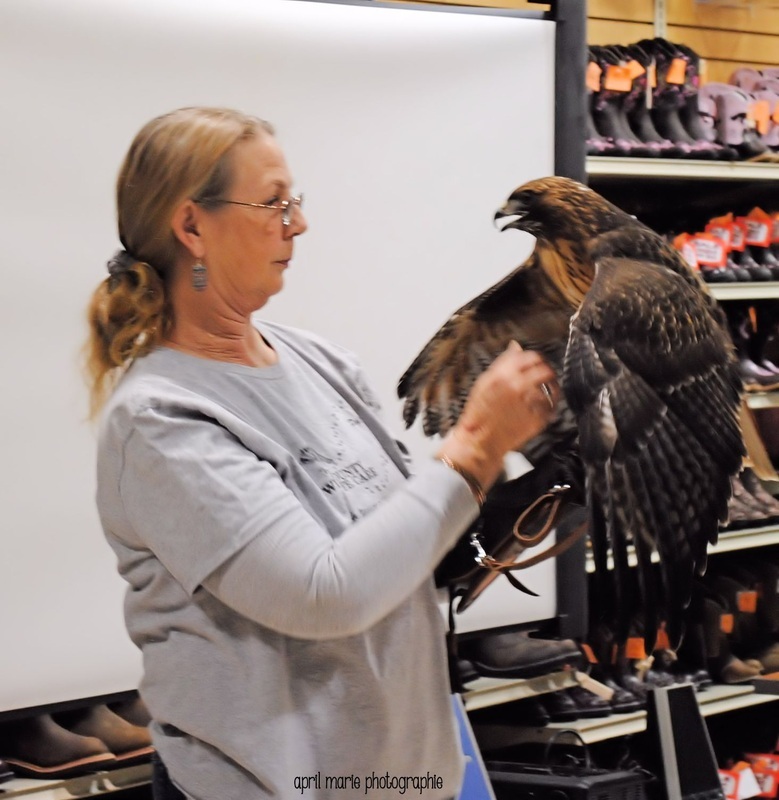 The tentative critter line-up includes a Swainson’s Hawk, a Great Horned Owl, a Screech Owl, a Saw-Whet Owl, and a Barn Owl. Wendy Ward, Sutter Creek Gallery’s featured artist for November, has always been curious and driven to explore deeper meanings in life, and for the past few years, her style of painting and creating art has been from the “inside out.” Using art to explore concepts, she first writes her intention and feelings on the canvas or in a journal, then shifts to using color and shapes to continue her exploration about the topic. Next, she creates an image based on what she sees during meditative visualizations. Most of Ward’s paintings or mixed media pieces have several layers of colors and symbols that transform as the piece progresses. “Peace,” “sensuality” and “love” are some of the concepts she has worked with along with playful encounters with faeries and mermaids. Often messages or poems are received during or after the process. She practices listening and allowing her connection to the image to continually direct the process. 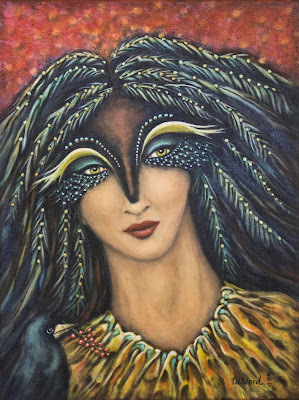 The artist has worked in various careers during her life including applications programming, finance and marketing and is grateful to finally have more time to create art. She works primarily in acrylic, mixed media, collage and photography. 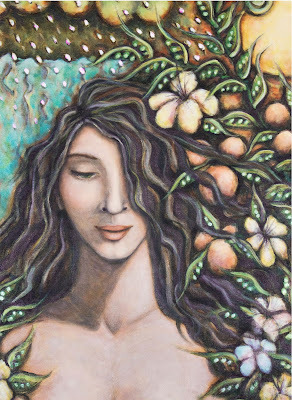 In addition to exhibiting at the Sutter Creek Gallery, her artwork can be seen throughout Amador County as part of the Art in Public Places program or on her website www.TheMermaidMuse.com. 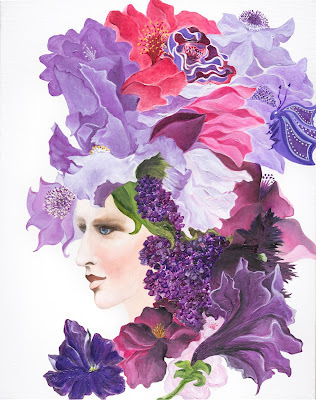 Sutter Creek Gallery invites you to meet Wendy Ward at the November 4 reception, starting at 2 p.m., to view her artwork exemplifying the theme “The soul speaks in images.” Also on hand will be tote bags and purses created by Mary Nahhas, pillows and small collages, all incorporating Ward’s designs. On December 2, the artist will be offering a Winter Faerie mixed media class at the Stockton Art League. To obtain more information about the class or to register, call 209-466-6604. 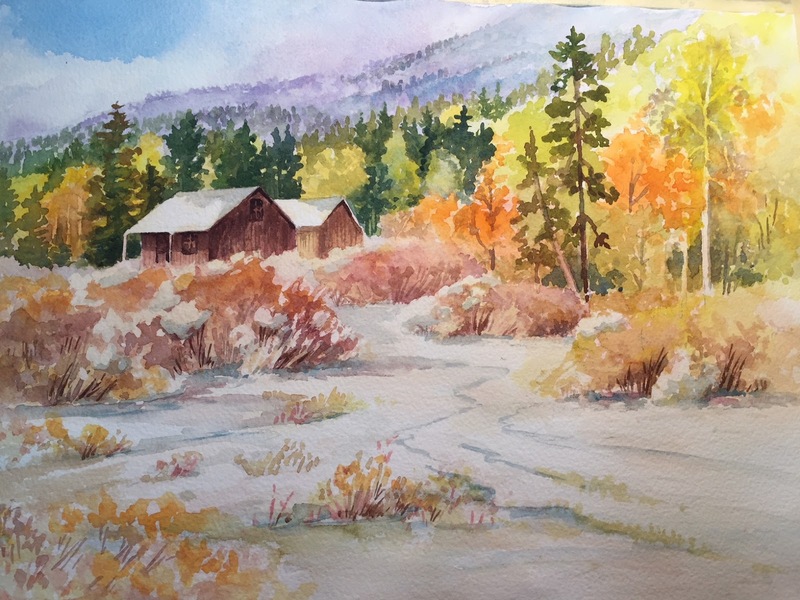 Wendy Ward is one of the many local artists exhibiting at the cooperative located in the heart of Sutter Creek at 35 Main Street. The gallery is open Sunday, Monday, Wednesday and Thursday from 10 a.m. to 5 p.m., Friday and Saturday from 10 a.m. to 6 p.m. For additional information, call 209-267-0228, email suttercreekgallery@gmail.com or visit www.suttercreekgallery.com. Sharon Galligan will be showing her collection of watercolors, acrylics and oil paintings at Gallery 10 during November. 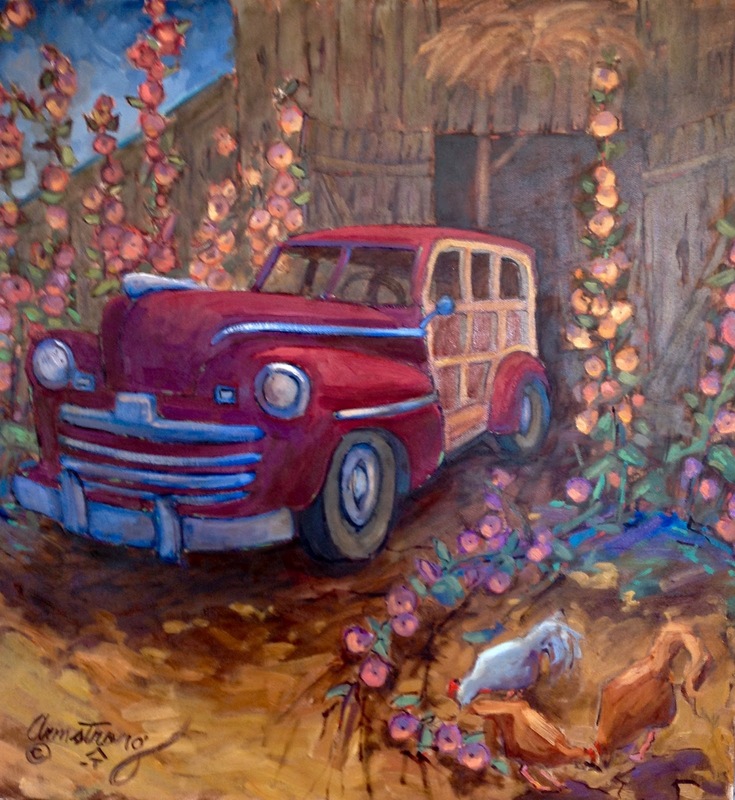 Sharon has been showing paintings professionally throughout northern California since 1978. In 1987 she and her husband moved to Amador County after raising their family in Los Gatos. 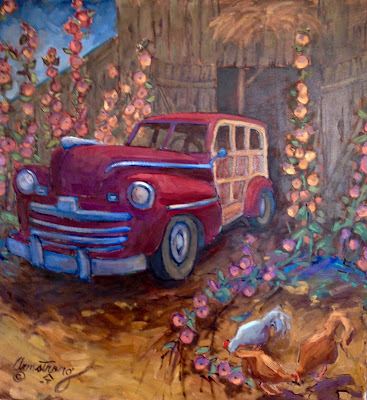 Many of Sharon’s subjects are California and European scenes: landscapes, stone villages, street scenes, flow shops, vineyards, lavender fields, boats, fishing villages, children at play, and a new special favorite, machinery. Her travels and workshops in the U.S. and Europe are a constant source of inspiration and subject matter for her art. 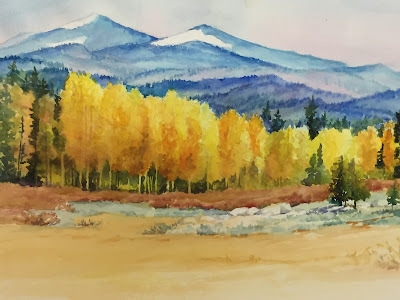 Sharon consistently wins awards in national and international juried shows, including the American Watercolor Society, National Watercolor Society, and Watercolor West. Her work has been featured in publications such as the American Art Review and North Light Magazine. 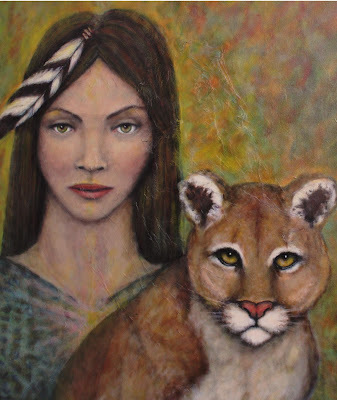 Sharon has been represented by galleries throughout California and in Scottsdale, AZ. She is currently showing her work at Sutter Creek Gallery and at Lee Youngman Gallery in Calistoga. A reception will be held in Sharon’s honor at Gallery 10, 15 Eureka St., Sutter Creek, on Saturday, November 4, 2-5 P.M. Everyone is welcome to stop by, meet Sharon, enjoy her beautiful work, and have refreshments. The paintings will be hanging all month. The gallery is open Thursday-Monday, and some Wednesdays, 11-5 throughout November. This is a show you won’t want to miss. 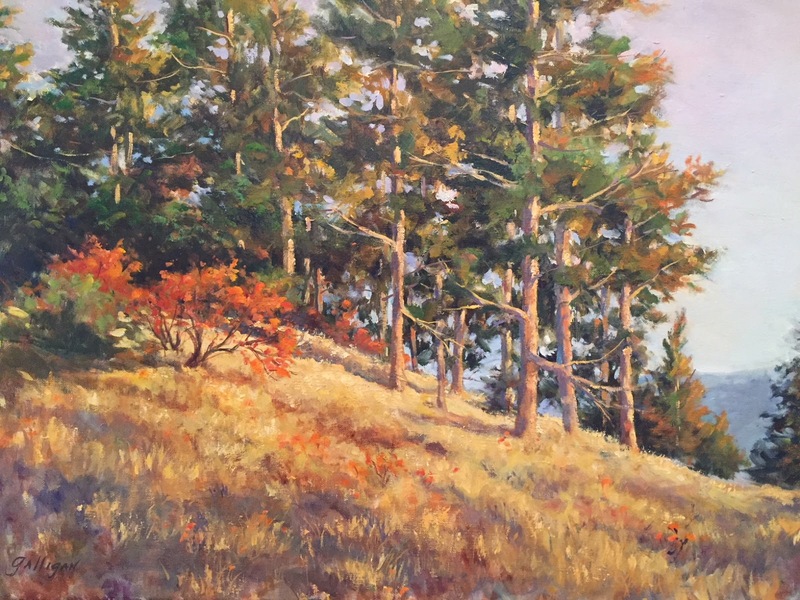 October at Gallery 10 in Sutter Creek: "Orange and Gold"
Gallery 10 is enthusiastic about autumn! At last the days are cooling down and colors are showing as the sun’s rays lengthen. The members and consignors of Gallery 10 will have paintings and photographs to celebrate the fall season. “Orange and Gold” is an inspiration to find the glorious colors that surround us at this time of year. A reception will be held at the gallery on Saturday, October 7, 2-4 P.M., at 15 Eureka Street, Sutter Creek. The show will hang all month. Gallery hours are Thursday-Monday, 11-5, and starting in October we will make every effort to be open on Tuesdays as well. Celebrate fall with us! Come and visit! Abstract artist Curtis Stromme will be demonstrating at the October 11 meeting of the Amador County Artists Association. The meeting will start at 7 p.m. in the Jackson Senior Center at 229 New York Ranch Road. Stromme realized quite early that creating acrylic abstract paintings was what brought him pleasure. Utilizing paper rather than canvas, he applies acrylic paint with blocks to create vivid compositions. 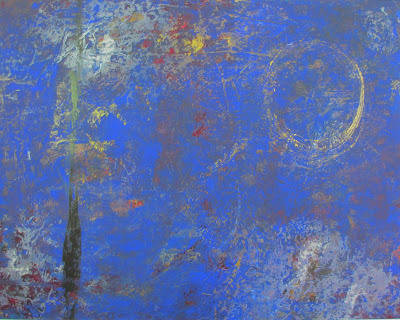 Some start with an intense blue background with additional colors skidding across the surface and sometimes colliding with those applied earlier. The layers of paint create a textural surface and metallic swirls and lines add vivacity. Gallery 10, Sutter Creek, will be celebrating 22 years as a premier spot in the foothills for showing Fine Art by having an Founding Members’ Invitational! Several of the original members of the gallery will be showing the paintings and sculpture they have done recently, and we will hang paintings by other original members as well. George McCann is currently showing his metalwork sculptures at the gallery and will bring paintings to show as well. Cathleen Berglund has some exciting new paintings to show. 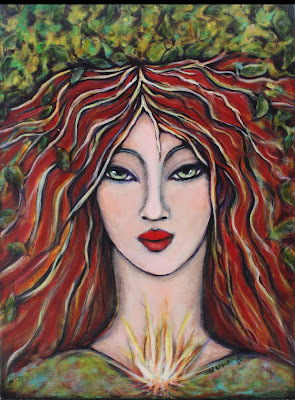 Jan Stevenson will be coming from San Francisco to show her work. 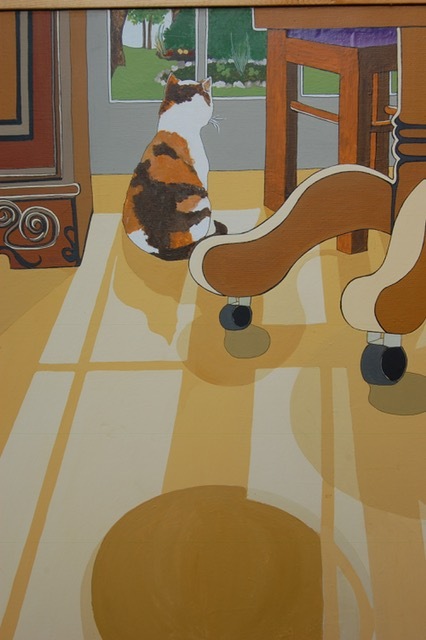 We will also feature paintings by Molly Kohlschreiber and Alice Duke. A reception honoring these founding members of Gallery 10 will be held on Saturday, September 2, 2-5 P.M. Everyone is welcome! The gallery will show these works all month during open hours, Thursday-Monday, 11-5, at 15 Eureka Street, Sutter Creek. Cathleen Berglund is quite certain she was carrying a satchel containing a sketch book when she was born! She has filled a thousand sketch books in the 7 decades since then! She studied art primarily with Maurice Lapp at Santa Rosa Junior College, whom she credits for her pronounced sense of color, balance, and humor. 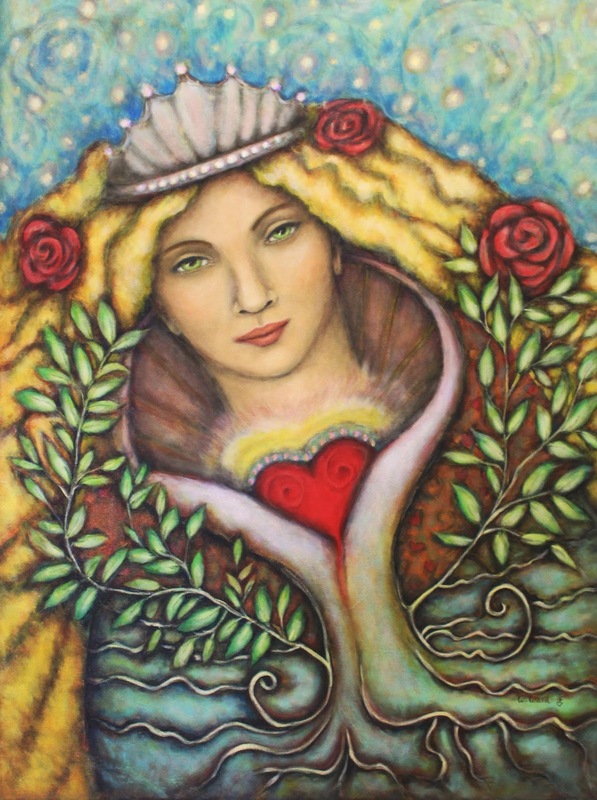 Her art has appeared in festivals and galleries in California, Washington State and Minnesota. 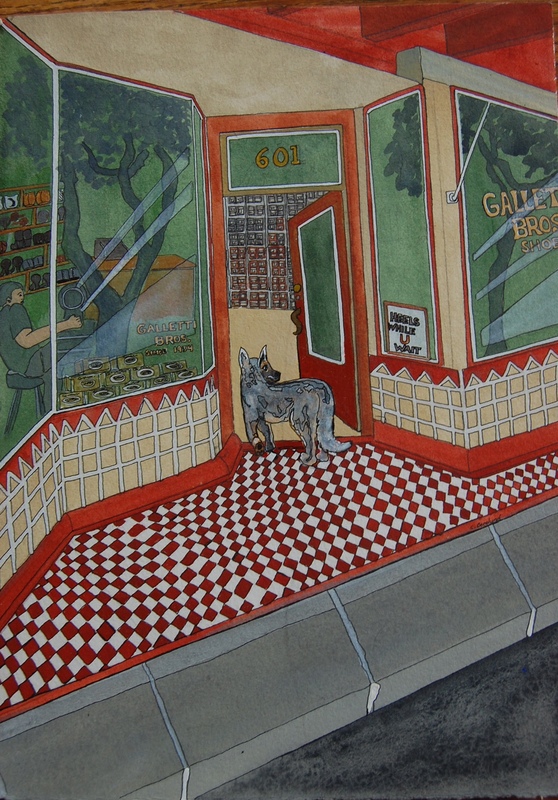 Cathleen joined forces with local artists in Amador County in 1995 to form Gallery 10. She managed the gallery for several years, and is honored to be featured in this collective show. George McCann is a painter and a sculptor. “My work, although often inspired by the natural world, is completely imaginary!” George says. He hopes it is perceived as whimsical and unique. 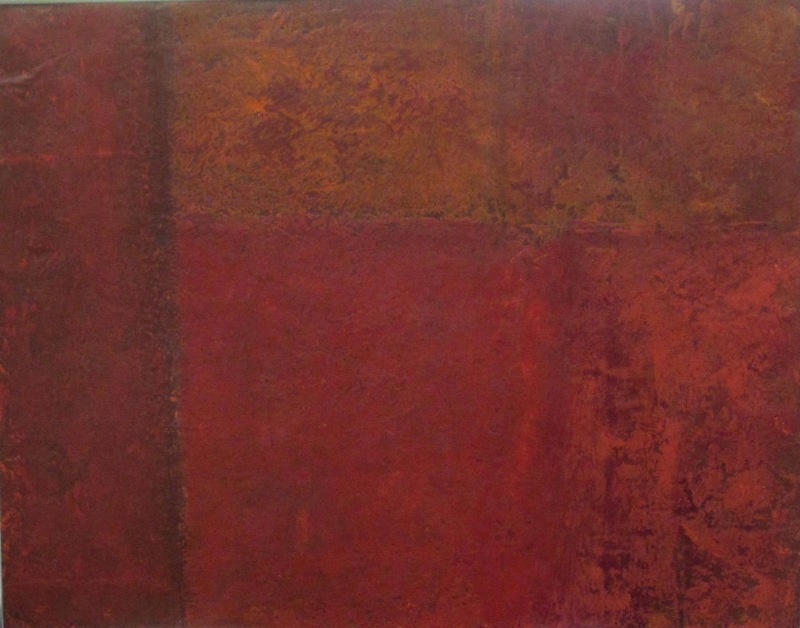 He considers himself a versatile artist, using a variety of mediums. George has worked as a graphic designer for various industrial establishments, as well as a college instructor in drawing and design. 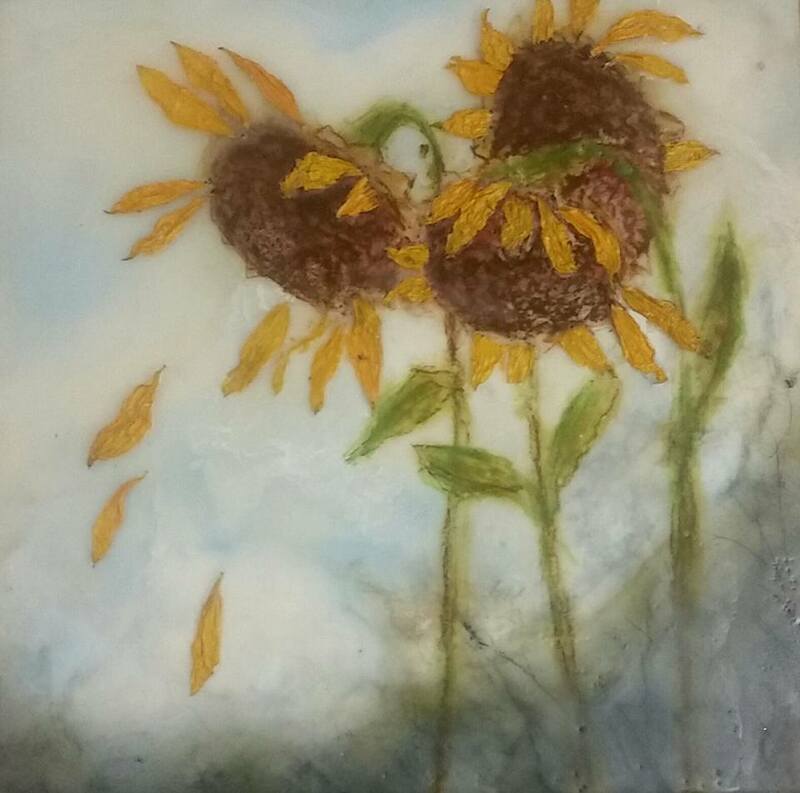 George uses gessoed boards with watercolor and lead pencils, and he makes encaustic paintings using a blowtorch to fuse oil paints and beeswax on non-tempered Masonite. He creates sculptures with soldered and wired copper and/or brass. Jan Stevenson received her degree in art history from USC and a teaching credential from Cal State LA. Jan began painting in watercolor, went into encaustics, combined with acrylics and collage. 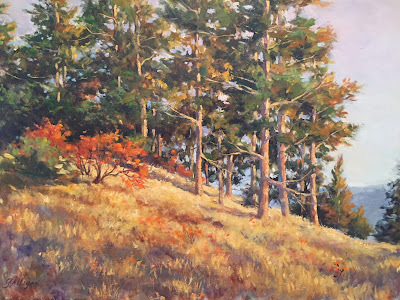 She lived in Amador County 20 years before moving to San Francisco, where she took classes and workshops in oil painting. “Oil is my passion!” Jan says. 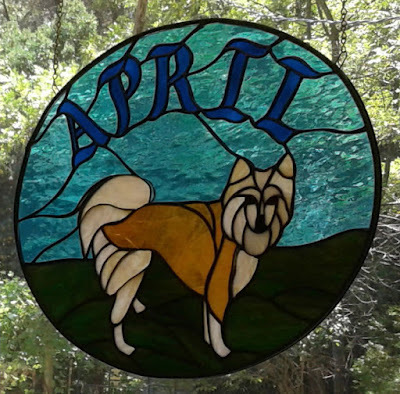 “I wish I had started earlier!” Jan has attended workshops and art classes her whole life, saying, “You can always learn something!” She taught Art in the Schools in Amador County and ran children’s workshops out of her studio many summers. 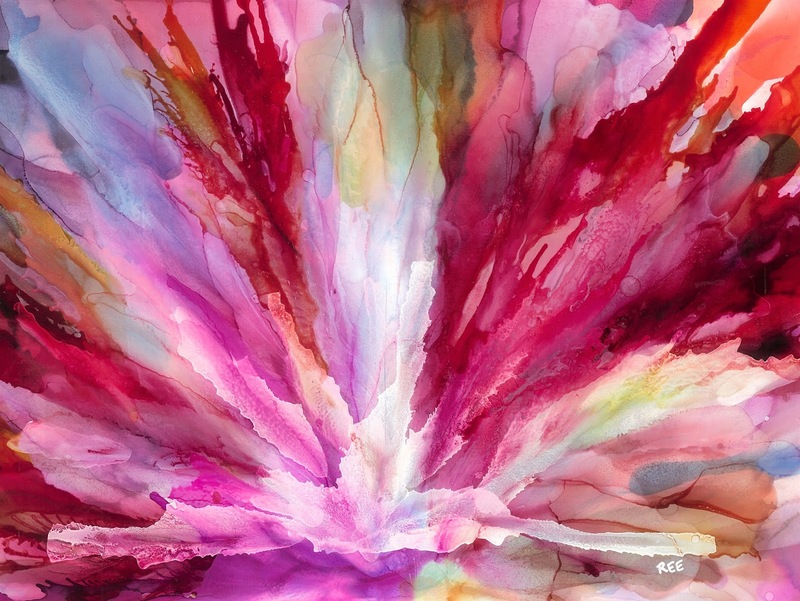 Molly Kohlschrieber has a large collection of watercolors and mixed media which she exhibits at Gallery 10. She is known and admired for her paintings of horses. 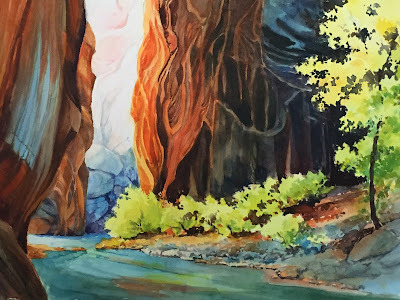 Her landscapes, which are often of the canyon country in the Southwest, are made by incorporating a photograph with watercolor in such a way as to be a celebration of color and design. 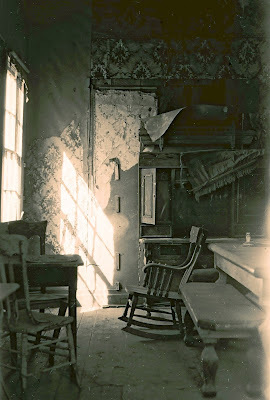 Alice Duke was a founding member also, and was known for her watercolors and etchings of local landscapes. Artists create using all sorts of surfaces: canvas, paper, and boards of all types. Leanne Kelly’s primary “canvas” is a gourd. 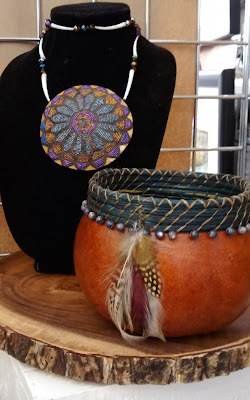 She carves and burns designs into the surface; applies paint, ink, wax and stain; and embellishes with beads, feathers, jewels, yarn and pine needles. In her hands, the final products are truly works of art. Among these are her very popular necklaces, gourd baskets—some quite tiny—as well as lamps and other decorative items. These unique artworks will be featured during the month of September at Sutter Creek Gallery. Sutter Creek Gallery invites you to meet Leanne Kelly at the September 2 reception, starting at 2 p.m., to view her exciting and unique creations, including colored pencil portraits of French mastiffs, which she breeds. She is one of the many local artists exhibiting at the cooperative located in the heart of Sutter Creek at 35 Main Street. Besides original paintings and photographs, Sutter Creek Gallery offers many affordable items including prints, cards, jewelry, ceramics and fiber arts. The gallery is open Sunday, Monday, Wednesday and Thursday from 10 a.m. to 5 p.m., Friday and Saturday from 1 a.m. to 6 p.m. For additional information, call 209-267-0228, email suttercreekgallery@gmail.com or visit www.suttercreekgallery.com. September will bring you coming attractions for the Open Studios event. 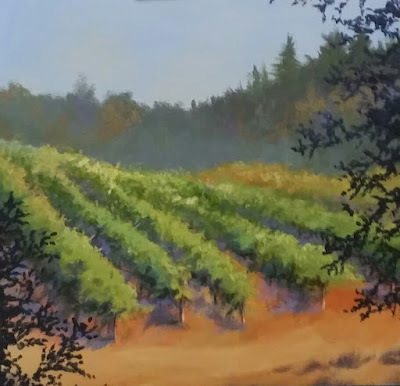 Hosted by the AmadorArts Gallery at 11-A Randolph Street, Sutter Creek, this preview will allow visitors to view a piece of art by each of the 25 artists participating in the Open Studios event. 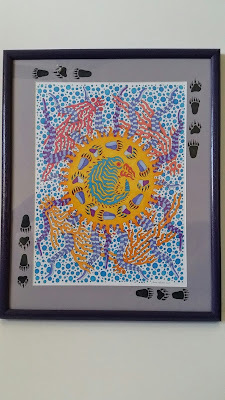 All artwork will be for sale and your purchase will benefit the Amador County Artists Association Scholarship Fund, the Arts Council Art in Schools programs, and the artists themselves. Below are images of some of the artwork that will be available during this show. A reception to introduce the preview show will be held Saturday, September 2, from 2 to 5 p.m. On hand will be a book of photos showing the artwork to be raffled off during the Open Studios event September 16 and 17 at the Sutter Creek Auditorium. Until the commencement of that exhibition on the 16th, tickets for raffle items will be available at the AmadorArts Gallery for $1 each. The preview show will continue through September 24. The AmadorArts Gallery is open regularly Saturday and Sunday from 11 a.m. to 4 p.m. If staff is on hand, it is also open Tuesday through Friday as well. Call ahead to check at 209-267-9038. 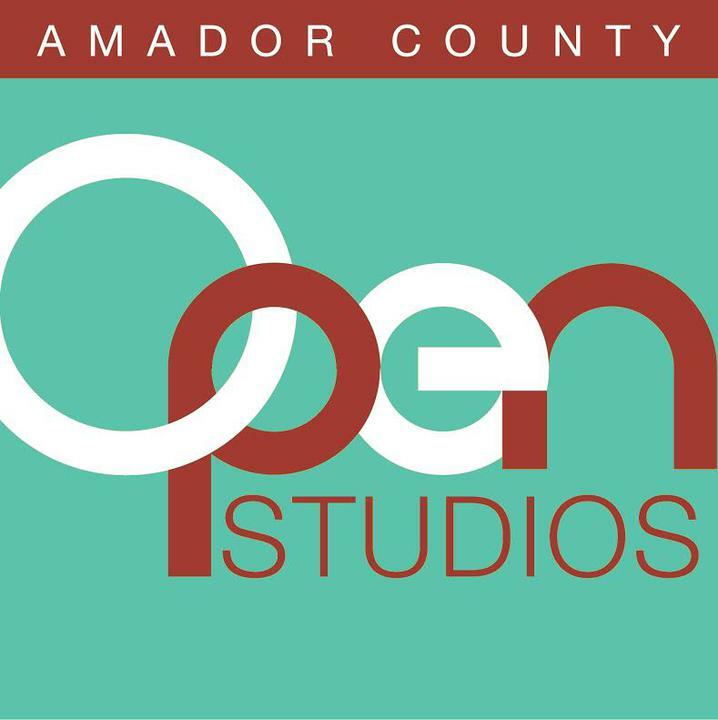 Sponsors for Open Studios: Revised Version are Jackson Rancheria, Gold Country Marketing, Amador County Arts Council, St. Katharine Drexel Men’s Club, Sutter Creek Gallery and Gallery 10. 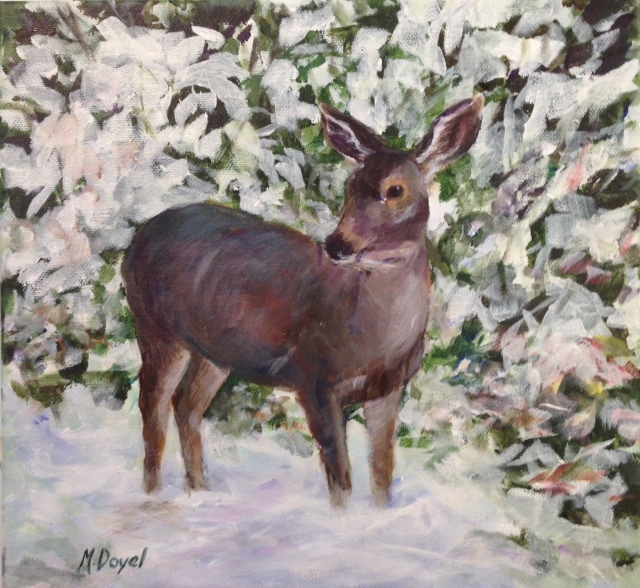 For more information about Open Studios, contact Cynthia Dunn-Selph at 623-703-3806 or dunnselphc@yahoo.com or visit the Artists Association website www.amadorartists.org. 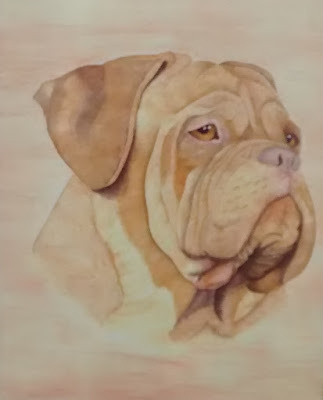 Dog lovers, here’s an art show for you! Sutter Creek Gallery’s August exhibition, Dog Days of Summer, will celebrate the canine, whether mutt or pure-bred, in paintings, photos, stained glass, prints and cards. The opening reception begins at 2 p.m. on Saturday, August 5. 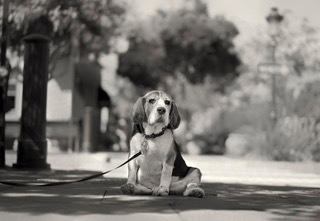 Well-behaved pooches accompanied by, and leashed to, their owners are invited to attend. On the day of the reception, we will have a donation box on hand to benefit our local A-Pal Humane Society which does so much to insure the humane treatment of animals. This organization’s adoption and spay/neuter programs have saved so many pets from euthanasia. Everything that goes into the box goes to A-Pal to further these vital programs. Sutter Creek Gallery is a cooperative of local artists in the heart of Sutter Creek at 35 Main Street. 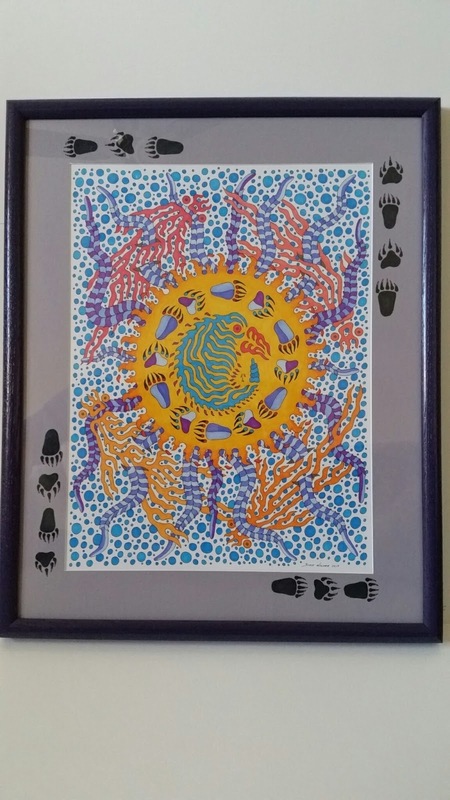 Besides original paintings and photographs, the gallery offers many affordable items including prints, cards, jewelry, ceramics, gourds and fiber arts. The gallery is open Sunday, Monday, Wednesday and Thursday from 10 a.m. to 5 p.m., Friday and Saturday from 10 a.m. to 6 p.m. For additional information, call 209-267-0228, email suttercreekgallery@gmail.com, or visit www.suttercreekgallery.com.